“The past is a flame you must learn to hold / your hand above,” Eric Leigh writes in this stunning first volume of poems, a poignant meditation on the harm that we can and cannot keep from those we love, and the harm that cannot be kept from us. Taking place in both the rural and the urban, in fields and on sidewalks, in gay bars and in laboratories, with topics as diverse and powerful as a father’s suicide, a mother’s resilience, coming out, lost love, and the continuing plight of HIV, Leigh’s poems locate the heartbreaking music in these struggles. At the center of this profound book about loss—of family, of love, of immunity—lies the spirit’s ability to persevere. “My worst fear has come true, / and I am still here walking,” Leigh writes. Indeed, these poems are as assured and brave as those steps toward an unknown future. At turns beautiful, disturbing, mournful, and redemptive, Harm’s Way is an accomplished debut. 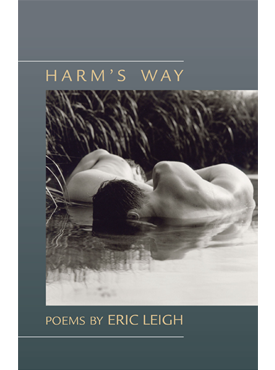 Harm’s Way is part of the University of Arkansas Press Poetry Series, edited by Enid Shomer. Eric Leigh received his MFA in poetry from the University of Michigan, where he was honored with Hopwood Awards in both poetry and non-fiction. His recent honors include a “Discovery”/The Nation Prize, the New Letters Prize for Poetry, the Robinson Jeffers Tor House Prize for Poetry, and a Dorothy Sargent Rosenberg Poetry Prize. He has been a finalist for the Agnes Lynch Starrett Poetry Prize, the Samuel French Morse Prize, and the Walt McDonald First-Book Competition in Poetry. He lives in San Francisco.